Based in the village of Laughton, East Sussex, 5 minutes from Glyndebourne, Little Shiplake is very rural and the property boasts 15 acres of South Downs’ fields which lead straight from the property. 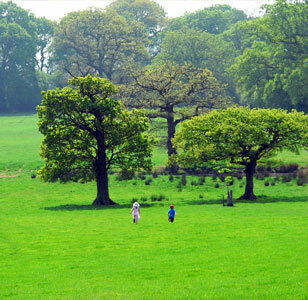 At the foot of the fields you will find a secluded woodland and stream, and pathway access to the local village church. 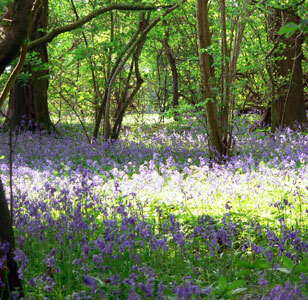 In the spring the floor of the woodland is a carpet of beautiful Bluebells for a few weeks, and must be seen to be believed. For a small additional cost, a picnic hamper can be arranged for you to enjoy in the fields and woodland areas. Little Shiplake is a two minute walk from the village pub, and shop and about 10 minutes from the village church and school.The Roebuck Inn our lovely village pub, has recently opened under new management and boasts a fantastic interior, complete with jelly fish tank and a great menu too. Set at the foot of the South Downs, Laughton is a quiet and pretty village, perfect for walking holidays and relaxing with nature. The historical town of Lewes is 7 miles to the West, Eastbourne is 15 miles to the East and Brighton is 15 miles to the South. There is a mainline station at Lewes with links to London on a regular basis. For families staying there is plenty to do within a 5 mile radius of Little Shiplake, for instance Blackberry Farm, Knockhatch Adventure Park, Springbarn Farm and Monkey Business are all favourites of ours. For walking the South Downs Way is nearby and the famous Cuckoo Trial is within a 10 minute drive from us. East Sussex National golf course and spa are also only a few miles away. The Love Supreme Festival which is held every July is two miles away in the village of Glynde. Glyndebourne opera house is 3 miles away in the neighbouring village of Glyndebourne and for guests attending the opera we may be able to help out with transport to and from the venue, which saves you worrying about driving and parking, and encourages a more relaxing stay. We are available to help with any other requests you may have and are happy to accommodate most situations to help improve your stay. There are plenty of lovely pubs and resturants we can recommend in the local area, some of which we have listed below with links where possible.The Roebuck Inn our local village pub, is only a 5 minute walk away and serves delicious food.